Dukes Creek has been rated as one of the top 100 trophy trout streams in the country. It is strictly a “catch and release” trout stream with special rules and regulations. Anglers must use artificial lures with barbless hooks. Anglers may not have any barbed hooks or non-artificial bait in their possession while on the stream. Possession of these items will result in a hefty fine. Artificial Lures: Any lure which is made completely of natural or colored wood, cork, feather, hair, rubber, metal, plastic, tinsel, Styrofoam, sponge, or string, or any combination of such materials, in imitation of or as a substitute for natural bait. This does not include any item sprayed with or containing scented or chemical attractants. Anglers must have a valid Georgia fishing license and a trout license. A WMA license is not required. A $5.00 park pass or an annual Friends parking pass or Georgia State Park Pass is required for each vehicle. Dukes Creek is open for fishing on Wednesday, Saturday and Sunday. Fishing days in March through September are Morning [7:30 – 1:30 pm] and evening [1:30-6:30 pm] sessions with 15 anglers per session. October through February fishing days have a single [7:30-4:30 pm] session with 15 anglers per day. 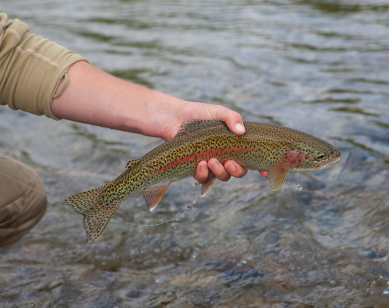 To help alleviate stress on the fish, trout fishing is often closed through hotter months. Due to the limited number of anglers allowed on Dukes Creek, it is best to make a reservation in advance. Fishing licenses, Georgia State Park Passes, and artificial fishing lures can be purchased at the Visitor Center upon arrival at Smithgall Woods. Anglers must confirm reservations at the Center upon arrival and obtain a free fishing permit with written guidelines and instructions for each day. Anglers must check in at the Center within the first half-hour of the fishing session. If an angler will be arriving after 8:00 am, he/she must notify the Visitor Center between 7:30 am – 8:00 am. If the Center is not notified by this time, the reserved space may be given to another fisherman. Anyone hoping to fish that has not made a reservation may stop by the Visitor Center to check for openings or no-show slots. These slots will be given away on a first-come first-serve basis each day. Also, anglers are asked to contact the Visitor Center if they are unable to attend for any reason to cancel their reservation so that their spaces may be given to another fisherman. Anglers park at the Visitor Center and may hike in or ride a DNR shuttle to the public accessible portions of Dukes Creek (approximately four miles of stream). The shuttle runs three (3) times per day. Anglers should check with Visitor Center employees for a schedule of shuttle runs. Normal shuttle hours are 8:00 am, 11:30 am and 4:00 pm for all day sessions and 8:00 am, 1:30 pm & 6:30 pm for morning and afternoon sessions. At the end of the fishing session, anglers must return to the Visitor Center to sign out. At this time, any subsequent fishing reservations can be made. Also, each angler will be asked to fill out a fishing survey that allows those who fish to aid in the scientific study of the stream. By completing the survey, anglers can help DNR to better manage the stream for your enjoyment. Please remember that this is a unique area and that rules and regulations must be strictly enforced to protect our natural resources. The trout season runs from the last Saturday in March through October 31 each year.